Michael Foster is the Lead Research Analyst for Contrarian Outlook. He is the only analyst in the world who is 100% devoted to CEFs with market caps under $1 billion. Michaels reports are widely read by analysts and portfolio managers at some of the largest hedge funds and investment banks in the world, with trillions of dollars in assets under management. 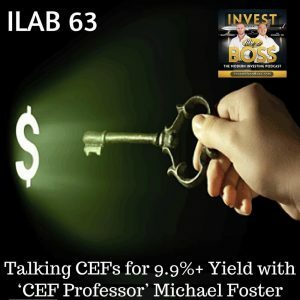 During the show, Brett Owens talks with Michael on the CEFs to buy with safe dividends and high yields. You’ll learn the difference between Closed End Funds, Mutual Funds, and Exchange Traded Funds including buying at a discount. Sam Marks will share his experience buying CEFs and explain the process. Listen to ILAB 63 on iTunes here or subscribe on your favorite podcast app.